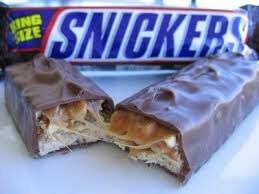 Snickers is a brand name chocolate bar made by Mars, Incorporated. It consists of nougat topped with caramel and peanuts, enrobed in milk chocolate. Snickers has annual global sales of $2 billion.